0	0	John Stott	In Stock - Order before 4pm for same day dispatchWant it on Wednesday 24 April? Banished from his Sunday School at All Souls, Langham Place, for hiding a dagger in his sock, John Stott was a little boy who was not expected to join the ministry. Far from it. His father had other hopes and ambitions for his first born son. So John received the best education that money could buy. He went to the best schools and the best university. John's family wanted him to be a success and a credit to the Stott name. And he was. John was bright, energetic and dedicated. However, something happened that changed the direction of his life. Family ambitions took second place to serving the Lord Jesus Christ and working for God's glory. So bizarrely the little boy who had been banished from All Souls Sunday School eventually became its curate and then its rector. He even became Chaplain to the Queen. 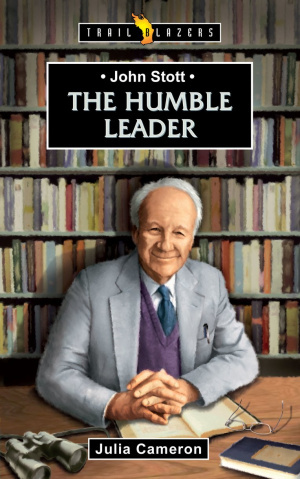 John Stott by Julia Cameron was published by Christian Focus Publications in March 2012 and is our 20306th best seller. The ISBN for John Stott is 9781845507879. All the books in this series although written for young people are very readable small biographies for people of all ages. Small? Well small in the number of pages and size of the book but huge in the content! I have read a fuller biography written for adults, but truly, if you want to know about this remarkable man, then you can do no better than to read this Trail Blazer. Julia Cameron starts with some delightful stories of John Stott’s early childhood, family was very important throughout his life, school days and his meeting with Eric Nash (Bash) who had such a strong influence on his lifelong commitment to students and young graduates. Then she describes his college years and his life at All Souls, Langham Place, London, from where he accepted prayerfully many opportunities for preaching and teaching worldwide. He wrote many books and being a firm believer in having enough but no more, gave away most of his royalties. His bolt hole was ‘The Hookses’ bought as a derelict farmhouse in Pembrokeshire, slowly developed, largely by his own and his friends labour, into a comfortable retreat which he lent to any who needed it. As his influence grew, he was called to do more and more until he employed Frances Whitehead as his secretary and she became his lifelong friend and support. One of the many friends we are told about in this book. Uncle John, as he was known to many, travelled widely, bird watching at every opportunity, a wise, very lovable, humble man who had an influence for the good on so many. There is much more in this book to learn about him. Do read it! Got a question? No problem! Just click here to ask us about John Stott.